Originally published in the North Island Gazette March 22, 2006. With the construction of the North Coast Trail many people have been introduced to the beautiful rugged wilderness of the North end of Vancouver Island. Most will not realize that in the early part of the twentieth century, almost every cove along this part of the coast was inhabited by rugged individuals who lived in near total isolation under trying conditions. The North Coast of the Island was at one time home to the Nahwetti First Nation, and is today claimed as the traditional territory of both the Quatsino and the Tlatlasikwala First Nations. A surveyor's report from November 1892 identifies 'Cache Creek' as the watershed to the East of the Cape Scott area. Apparently fishermen would cache belongings in this cove while they made their way offshore to their fishing grounds. Gold and fool's gold were both found on the banks of an adjacent "Irony Creek," and on the beach. Soren Christainsen was the first to homestead at the mouth of Cache Creek in the 1890s. His sister Marie arrived in 1903 and helped him to take care of his home. Soren Hill is named for this early settler. In 1905 Harry Shuttleworth homesteaded to the west of Cache Creek. He married Christiansen's sister in 1908. The Shuttleworths farmed and raised 30 head of cattle which were pastured under the large old growth trees of the rainforest. The year 1911 was a busy one in Cache Creek. James Sim pre-empted a quarter section, and he and his wife Jesse and their twin babies walked all of their belongings along a trail to their homestead. Harry Shuttleworth's brother Robert, his wife Sarah, and their five children also arrived. A friend of the Shuttleworths, Tom Lockwood, also arrived with his family. In December of that year the Sim's home burned down and the family lost everything. Locals helped them to build another house, but the possessions which the family had brought with them from Scotland were all lost. In March 1911 a post office was established with Harry Shuttleworth as postmaster, but the community was not allowed to use the name Cache Creek, because there was already a Cache Creek in BC. Marie (Christiansen) Shuttleworth suggested that the community be named after Strandby, the town of her childhood on the North East shore of Denmark. In 1912 another three families arrived in the area, and the following year a school opened in the Sim's residence. A small store also operated in the community. Strandby had approximately 14 families as permanent residents at the is time, and a trail was constructed from Strandby to Nahwitti. With no steamer service and no road to connect it to other communities on the North Island, life in Strandby was difficult. Settlers were stuck in the wilderness for months at a time, and had to rely on their ingenuity to survive. With the outbreak of the Great War many people left their homesteads to enlist or to join the war effort. Strandby existed until 1921, but the population steadily dwindled. Soren Christiansen died in 1915 and was buried on the hill overlooking the bay. James Sim lived on "The Stump Ranch" until 1938, and afterward continued to visit the area. Marie and Henry Shuttleworth lived in Strandby until their deaths in 1938 and 1941. They are buried in the Anglican cemetery in Alert Bay. In 1947 the Hydrographic Service recommended identifying the location of the now abandoned town site as Stranby, for the old townsite and post office. The name stuck until local historian Ruth Botel noted the discrepancy in spelling, and in 2005 the name was officially changed back to Strandby. This article originally appeared in the North Island Gazette December 23, 2014. Allison Harbour lies across Queen Charlotte Straight, near the entrance to Nakwakto Rapids, at the entrance to Seymour Inlet. It is within the traditional territories of the ’Nakwaxda’xw Nation. In the early 1900s Seymour Inlet was a busy place for hand-loggers, with small camps dotting the inlet. Steamships and barges preferred not to negotiate the tidal rapids, one of the highest flows of tidal exchange in the world, and protected Allison Harbour became an important transportation hub. Originally called False Bay, or False Schooner Passage, Allison Harbour was officially named after a coastal logging entrepreneur, A.P. Allison in 1950. It had been known by that name since the 1920s. In 1924 a detailed marine survey was done of Allison Harbour and an official chart released. This was important due to the reefs which posed a hazard to ships entering the cove. A post office was established in the Harbour in 1927, and the float community also became a steamship stop, serviced by the Union Steamship Company vessel Chelosin (colloquially known as the “Charlie Olsen”). In the late 1920s Mr. and Mrs. Bellam operated a bunkhouse in Allison Harbour. A small café also operated in the area. In 1937 Percy Sutherland was appointed the local commissioner for the provincial election. Vic and Melva Eckstein moved to Allison Harbour in 1947 to take over the post office, store and a marine service station. They later added a sawmill to the operations. All of the buildings were on floats. They, and an old trapper, were the sole occupants of the harbour for many years. They were always optimistic that a boom was coming for the area, however in 1954 when float plane service made the Allison Harbour steamship stop obsolete, the Ecksteins moved to Gibsons, and the little community of Allison Harbour began its decent into obscurity. EJ Hughes painting, "The Store at Allison Harbour" 1955. Well known Canadian painter E.J. 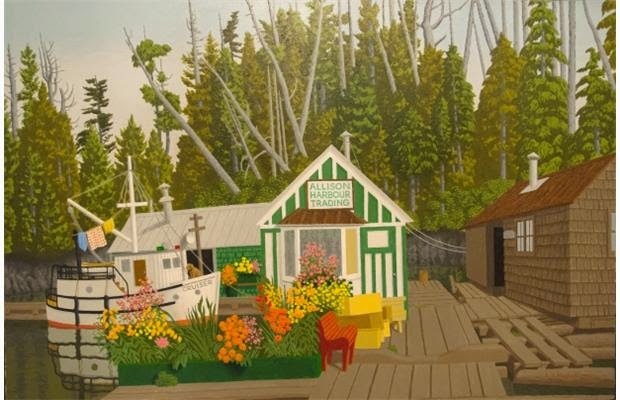 Hughes (1913 – 2007) painted “The Store at Allison Harbour” in 1955. In 2007 the painting sold for $245,700. It is currently owned by collector Jacques Barbeau, and is on display at Micheal Audain’s museum in Whistler. In 1965 transport companies started delivering freight directly to logging camps in Seymour Inlet, and the last remaining vestiges of the settlement were soon abandoned. More recently, the provincial government and The Land Conservancy jointly purchased a tract of privately owned land in Allison Harbour, and in 2008 BC approved the ‘Class A’ Allison Harbour Marine Park, which includes 89 hectares of land and 43 hectares of foreshore. It is a part of the larger Ugw iwa’/Cape Caution Conservancy. The management plan states that there are remnants of an old cannery building in Allison Harbour, although I have not been able to find any references stating a cannery was in operation in this location. Last year the University of British Columbia Collections used Allison Harbour as an example of a place in BC for which is it very hard to find any historic information. There is an "Allison Harbour Room" in the Barber Building at UBC (room 263). If your family has any photos or information on Allison Harbour please contact me.